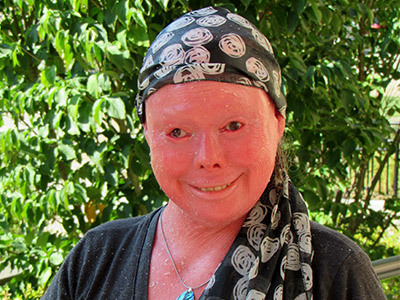 A rare, non-communicable genetic disorder, and one that few newborns survive past infancy, Harlequin ichthyosis causes the overproduction of skin cells, which leaves the skin porous and prone to infection. When Hunter was born, fewer than five babies suffering from the disorder were known to be living. Hunter’s mom, Patti, became a leading advocate for her daughter through volunteer involvement with the Foundation for Ichthyosis and Related Skin Types (FIRST). But Patti, a police officer in Pittsburgh, died from pancreatic cancer when Hunter was barely 17. The next summer, Hunter attended SYI. “That experience helped me discern what God was calling me to do and who God was calling me to be,” she says. Part of that discernment process confirmed the importance of her mother’s advocacy for her. “My mother helped educate people about this most-often fatal disorder,” says Hunter. “I wanted to continue doing that, and so did my dad.” So they began participating in the touring concert, “Release the Butterfly,” a show that raises awareness and funds for FIRST. For the next four years and onward, Hunter performed in the show, which combines music, art, and education, and her dad helped with logistics. While she was participating in concerts, Hunter was enrolled at Westminster College (New Wilmington, Pa.), where she wrote and produced the play Not Drawn to Scale to foster understanding of what she and others affected with ichthyosis endure. The four performances of the play included a monologue by Hunter, playing herself—a monologue that ended with a statement recalling her mother’s encouragement of fortitude as Hunter interacts with others: “I don’t care if you stare at me. I do care if you look away.” Not Drawn to Scale was recognized as a Regional Semi Finalist in the Kennedy Center American College Theater Festival New Playwright’s Program in January 2018. But Hunter wasn’t finished telling her story after producing the play and graduating from Westminster last May. “God gave me a story to tell and the tools to tell it,” she says, so she’s expanding her opportunities to do just that at Pittsburgh Seminary, where through SYI she had started discerning her call into ministry. As a master’s student preparing for a unique call that fosters understanding and compassion, Hunter says she has found the Seminary a welcoming environment in which to learn more about God, about others, and about the unique gifts and opportunities God has given to each and every one of us.